This scarf is 100% polyester interlock knit fabric. 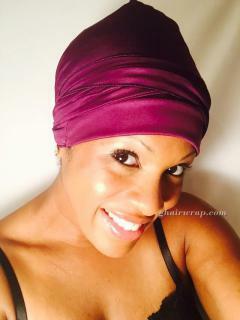 It's stretchable, so it conforms comfortably to your head--great for wrap sets or short hair. 100% polyester. Lightweight and stretchable with Lycra stretch lace stays on while you sleep. Machine or hand wash delicate. One size fit most. Magenta--out of stock.